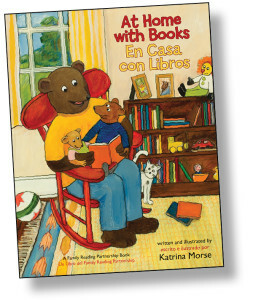 With At Home with Books/En casa con libros, a Family Reading Partnership book written and illustrated by Katrina Morse. Hear “At Home with Books” read aloud by the author/illustrator, Katrina Morse! Download Summer Reading Bookmarks featuring the Bear Family for all your students! Head Start families receive the book At Home with Books/En casa con libros, at an initial home visit by a family educator at the beginning of the program year. The book given to the family is a story for children that is also embedded with read-aloud strategies for adults. Family educators use the Staff Resource Guide /to help the family complete a Home Literacy Self-Assessment /Auto-asesoría familiar and read-aloud goals are made for the year. Additional resources are given to the family throughout the year to support reading to children and creating a literacy-rich home. See below to download all resources. Educate families about the importance of reading aloud to young children. Assess current literacy practices in a Head Start family. Help families create home literacy goals. Support everyday read-aloud and a literacy-rich home for families. 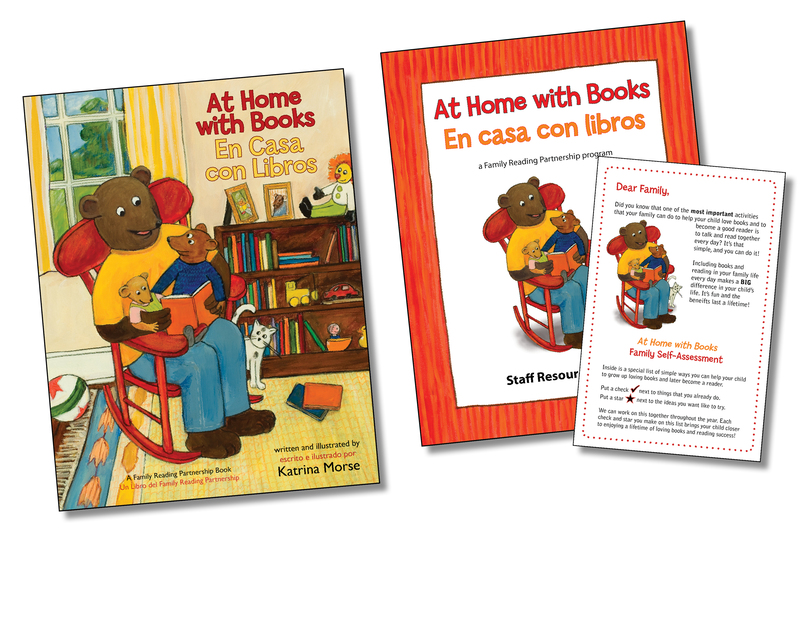 At Home with Books/En casa con libros was created as a resource for Family Reading Partnership to educate families about importance of reading to children and support adults in reading aloud. This children’s book is the gentle story of the Bear Family and the fun they have reading together at home with friends and family members. Their pet cat Patches is always listening in, curious about each book read. Embedded in the comforting tale and beautiful illustrations are subtle messages to families about how to make the read-aloud experience more meaningful for children. Order At Home with Books/En casa con libros, the English/Spanish children’s book to give to families and read aloud. Home Literacy Self-Assessment – Families can see what they are already doing at home and then establish goals for reading aloud and making books a part of everyday life. Auto-asesoría familiar – Home Literacy Self-Assessment in Spanish. 10 Great Reasons to Read Aloud to Children (English/Spanish) – children learn words and ideas, develop their curiosity and imagination, and so much more, just by hearing books read aloud! Tips for Sharing Books – Learn techniques for reading to Babies, Toddlers, and Preschoolers. Talk Sing Read Play card – Babies and toddlers benefit by hearing words in everyday family life through talking, singing, reading, and playing. Hearing words spoken aloud in the context of family activity enriches the learning process. Word Play – Make the most of play time as you introduce words and have fun with them! Words of Love – Tell and show your child how they are loved so they feel the secure in themselves and their abilities. Words of Encouragement – Giving encouragement helps a child build resilience and gain confidence to learn and grow. Screen Time – Is it good? Is it bad? Read what experts say about screen time for babies and young children.